Description from the publisher: Trederra is a distant, industrial age alien world that is engulfed in massive, never-ending conflict between its varied nations. They fuel their weapons of war with Dark Stone, in an arms race for dominance and destruction! Now, they have begun to run out of resources, especially the Dark Stone needed to build their bombs, tanks, and munitions. Desperate to gain the upper hand, they send out raiding parties through the many Gates that have torn open on their world. These raiders are ruthless in their search for Dark Stone and will stop at nothing. 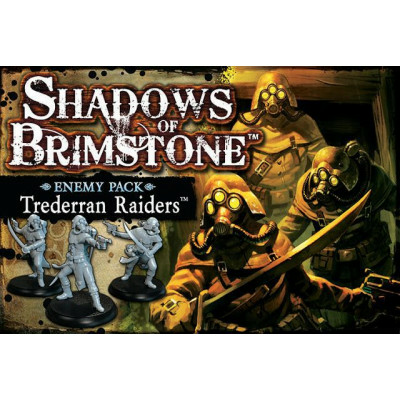 The Shadows of Brimstone: Trederran Raiders Enemy Pack contains everything you need to add these alien soldier Trederran Raiders to your games of Shadows of Brimstone! There are six Trederran Raider models included, as well as the large Enemy Record Sheet and all of the Threat Cards needed to add them to your games.